An elephant living in the house is one of three short stories about pets, available in this online anthology by West Australian writer Sharyn Bajerai. The other stories are titled Matt’s pet tarantula and Lee. 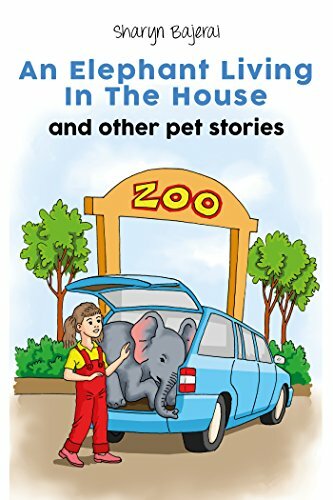 In the first story, Olivia wants an elephant for a pet but pesky old Mum and Dad say no. So what’s a girl to do but steal one from the zoo and keep it in her bedroom? Soon however, Olivia discovers that elephants aren’t all that easy to hide - or to look after - because they eat so much! An entertaining twist at the conclusion, after Olivia has returned the elephant to the zoo, is quite delightful. The second story is also about a child keeping a pet in his bedroom – this time a pet tarantula. Although he doesn’t ask his parents about keeping the spider, Matt’s a ‘responsible’ pet owner who finds the correct foods for Wolfgang to eat, and also creates a proper habitat so that the spider has places to hide and moult. When the spider foils a home invader, the jig is up and happily, Matt’s allowed to keep Wolfgang. The third story is about a mistreated greyhound who is found and helped by a young boy who takes her to the nearby animal shelter. Through watching the greyhound’s interactions with other abandoned animals, the boy is able to convince the shelter to keep the dog as a ‘helper’ so he can visit her. These stories variously contain appealing and entertaining ideas that explore the notion of longing for something impractical, of looking after other creatures, of taking responsibility for actions. One little aside is that I was surprised that the idea of ‘screaming like a girl’ was included - but that’s just me taking umbrage! With illustrations to break up the text, each story in the compilation consists of four chapters and has a satisfying, sometimes surprising, conclusion. This is an entertaining series of stories that will appeal to both boys and girls.